Sunflower seeds come from the large seed heads of sunflower plants. Once seeds are harvested and the shells are removed, only the edible kernel remains, which is a good source of calories from fats, proteins and carbohydrates. According to the U.S. Department of Agriculture, a 1/4-cup serving of shelled sunflower seeds provides around 218 calories. Approximately 153 calories are fats, 32 calories are carbohydrates and 28 more calories are proteins. A 1/4-cup portion of shelled sunflower seeds can serve as 10 percent of the calories recommended for the average person per day. This percentage is based on a typical diet of 2,000 calories per day. The USDA also states that a 1/4-cup serving of shelled sunflower seeds weighs around 33 g. Approximately 18 g are fats, 8 g are carbohydrates and another 7 g are carbohydrates. The remainder consists of water, indigestible matter and other nutrients. 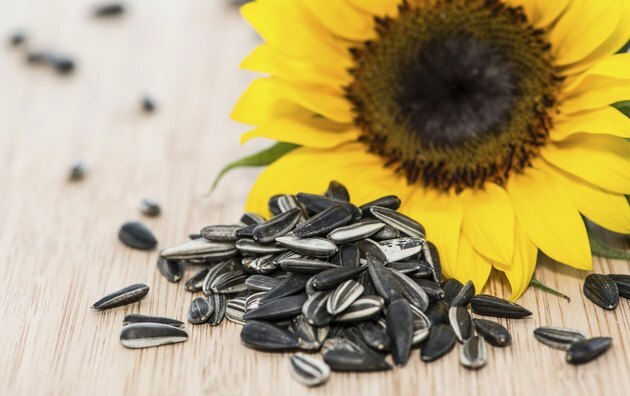 Several dietary minerals are present within a serving of shelled sunflower seeds including manganese, copper, zinc, potassium, phosphorus, magnesium, iron and calcium. Vitamins are also available from the serving and include pantothenic acid, folate, vitamin B6, niacin, riboflavin and thiamin.